Summer is here, and as temperatures soar, chances of heatstroke, dehydration, and sunburn also increase. Summer can be tough on you if you’re not prepared, so make sure you start putting together your cooling kit right away. As you’re gathering your high-SPF sunscreen, UV-proof sunglasses, and electrolyte-rich hydration packs to beat the heat, consider how advances in technology have helped you stay one-step-ahead of ailments that could prove to be seriously damaging in the long-term. We live at a time when summers are about to get a whole lot hotter, courtesy of climate change, but thanks to advances in technology there are ways to stay cool, safe and also prevent further environmental degradation as we do so! So if you’re considering buying a new air conditioner this summer, consider investing in a high-tech model. You may find that getting energy efficient, Wi-Fi operated smart AC is a lot cheaper than you think, and what’s more, you could be saving a lot on electricity costs in the long-term, while also keeping your room free from germs, dampness, or dangerous emissions. If you’re wondering where to start your search, look no further than the Bajaj Finserv EMI Network, which has launched its annual Summer Sale! The Bajaj Finserv EMI Network connects you to over 60,000 online and offline retailers, across 1,300 cities, and allows you to browse through a range of over a million top-of-the-line products. You can browse through the latest air conditioners all available on easy EMI from the best local and international brands. Compare the prices, features, customisations and more—all with the assurance that paying for your purchase is going to be simpler than it’s ever been! All you have to do is use your EMI Network Card at checkout to convert your purchase into No Cost EMIs starting at Rs.1,999. If you’re buying the AC at one of the partner retailers and do not have an EMI Network Card to your credit, you can also use in-store financing to complete your purchase. As a part of the Summer Sale, you’re also entitled to an Rs.5,000 Insta Credit and an Rs. 7,000 Insta Credit when you shop for an AC worth Rs.20,000 and Rs.40,000 respectively. This amount will directly get deposited into your Bajaj Finserv Wallet. With all this on offer, your summer-ready, hi-tech AC is just a few clicks away. So, all you need to worry about is finding the perfect model. This Lloyd AC is perfect for rooms of up to 150sq.ft. which is a testament to its cooling capacity, considering it is a window unit. Fitted with a 100% copper coil that boosts heat transfer and requires a much lower maintenance as well as Self Clean technology that automatically cleans the coil so that the air you breathe is kept free of dust and allergens, this AC has all the specs that make it a steal for its very competitive price. It also happens to offer Wi-Fi control that makes it completely user-friendly. The energy efficiency of this LG AC is boosted by its 4 Way Auto Air Swing technology, which allows for uniform cooling across the room. What’s more, the automatic fan control ensures that the room stays at the set temperature without compromising on cooling, keeping you comfortable and also saving you a large electricity bill to pay. All in all, this unit is a great choice for any medium-sized room of up to 150sq.ft. Credited with a 5 star rating, this Samsung AC has all the energy efficient features you’d want and more. The Digital Inverter 8-Pole allows for a much quieter and more efficient cooling mechanism and is enhanced by a stabiliser-free operation that minimises damage due to any sudden voltage fluctuations. The technology that sets this AC apart is the 3 Care Filter, which is a special mesh that effectively eliminates 99% of the viruses, bacteria and allergens in the air. Coupled with the Auto Clean function that removes dust and moisture, this AC is specially geared to keep you and your family healthy and cool all year round. Perfect for rooms that are under 100sq.ft., this Godrej AC has been conferred a 5 star rating by the Bureau of Energy Efficiency, as per their 2019 standards. This AC is equipped with a state-of-the-art refrigerant called R 410A, which is one of the most eco-friendly refrigerants available today. What’s more, its dehumidification technology keeps your room dampness free, and the Arctic Cool Technology of the AC cools your room faster, with extra efficiency, at a much lower electricity cost. 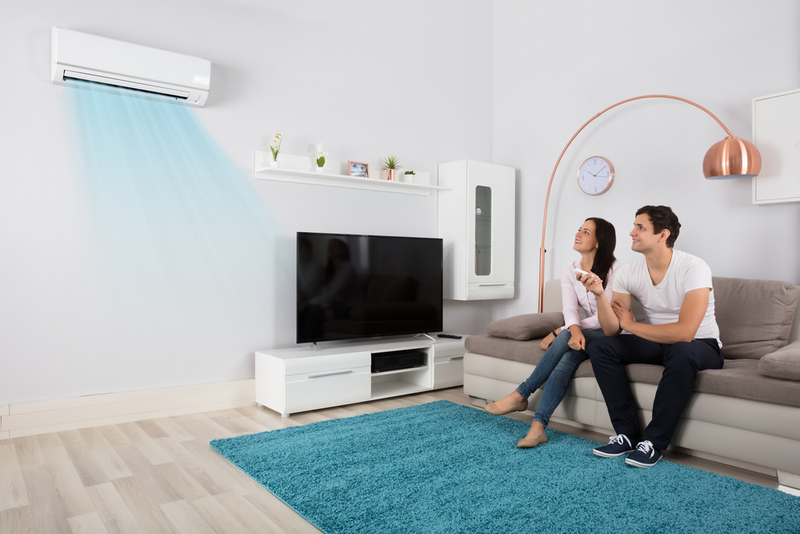 A speciality feature of this Blue Star AC is its unique iFeel technology, which is able to sense the temperature of the room through the remote control as well as through the unit itself. This means that the temperature control system is a lot more attuned to the temperature around you, and therefore, more capable of keeping you comfortable. This feature, of course, comes in addition to a host of other must-have features like the anti-bacterial filter and self-diagnosis technology that automatically alerts you when a repair or service is required. Finding the right AC is a matter of knowing what best suits your home or workplace, and what features are most applicable to your unique circumstances. Once you’ve zeroed down on a unit that works for you, head over to Bajaj Finserv and check your pre-approved offer right away. Once you’ve signed up, you can shop hassle-free across the Bajaj Finserv EMI Network, converting all your purchases into No Cost EMIs and making the most of special summer discounts and cashback.